Diaphragm pulse valves are for controlling air pulses in dust collectors. A coupling connection allows for a quick and simple installation. 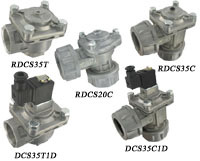 Valves are offered in both integrated and remote coil configurations. 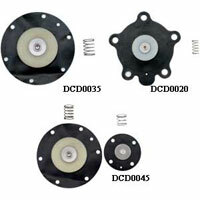 Repair Kit are replacement diaphragm kits. Includes the standard wearing parts of the valve for field replacement. 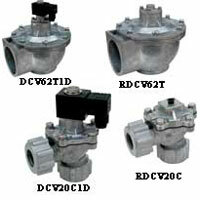 Diaphragm Valve is ideal for use with duct collection timer boards. Allows for a quick and simple installation. Design offers not only ease of installation, but also minimal airflow restriction. Springless Diaphragm Valves are ideal with duct collection timer boards. The design offers not only durability, but also reliability for a cleaning pulse. Offered in both integrated and remote coil configurations.